Brim Fell forms a long ridge that links the Old Man of Coniston to Swirl How, staying about 2,200 feet all the way. The eastern and western faces are very different - in the west Brim Fell drops down into the Seathwaite valley in one smooth slope, but in the east it drops down over a series of crags towards Low Water and Levers Water and the mines and quarries above Coniston. On the map Brim Fell does look like part of the Old Man of Coniston, just a rise in its northern ridge, but on the ground it feels like a separate fell. The summit of the Old Man can be seen sitting over the cliffs above Low Water. 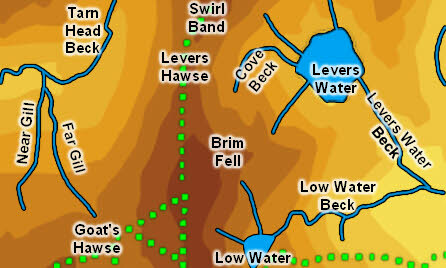 There isn't much of a drop from the top of Brim Fell to the start of the climb up to the Old Man, but the ridge does narrow as it passes Low Water, and the path down to Goat's Hawse in the west also act as something of a dividing line. The most popular route to the summit is the ridge walk from Swirl How to The Old Man of Coniston. This runs along the full length of the fell, and is a pleasant high level walk. The eastern flank is steep and craggy. There is a footpath heading up to Levers Hawse from Levers Water, although this is steep especially towards the top. Wainwright has two routes via Raven Tor on the eastern slopes, neither of which I have tried. In the west the OS map shows rights of way heading from Goat's Hawse to the summit and from the Seathwaite valley to Levers Hawse, but neither of these paths is visible on the ground. The route from Goat's Hawse is an easy walk, heading straight across the grass, but the Levers Hawse route would be over-steep. Our ascent of the Old Man from the Duddon passes along the full length of Brim Fell while heading from Swirl How to the Old Man. The summit is a flat rocky plateau, of most interest for the views towards Swirl How and the Old Man, but of little interest in its own right. In the west Far Gill runs north from Goat's Hawse and joins with Tarn Head Beck at the bottom of the valley. Tarn Head Beck runs along the foot of the western slopes. No streams run from Levers Hawse. A small stream runs south from Goat's Hawse to Goat's Water. In the east Cove Beck forms below the northern crags and runs into Levers Water. A number of nameless becks run down into Low Water, merging in the beck to form Low Water Beck. Cove Beck and Low Water Beck both join Levers Water Beck, which forms the eastern boundary of the fell. Brim Fell can claim part of Low Water, which it shares with the Old Man and part of Levers Water, shared with Swirl How and Black Sails. In the west Goat's Water and Seathwaite Tarn both just all outside the fell.